After an IMAX poster for the sequel/reboot Transformers: Age of Extinction arrived earlier this month, another new poster keeps the new marketing aesthetic alive. 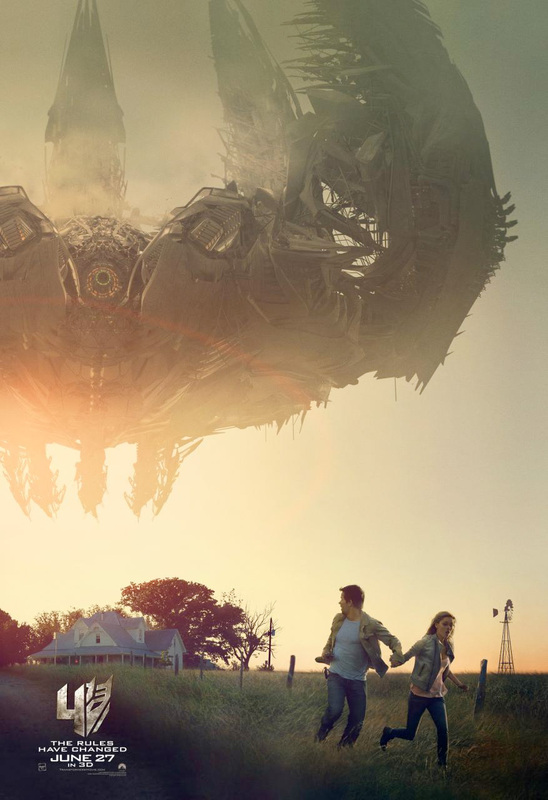 In this one, we're still on the farm, but Mark Wahlberg and his daughter Nicola Peltz are running from the new enemy that has emerged on Earth at a time when the Transformers are being hunted down, having been banished from the planet and disavowed by the government that once trusted them to protect us. These posters are much better than the Photoshopped floating heads and other lame designs, so maybe there's hope for a fresh sequel too. Look! Pretty bad imo - you'd expect Wahlberg to be looking at the HUGE ALIEN SHIP and not at his house. Yeah...not going to outrun that ship. "Come on, come on, feel it feel it, feel the vibration." ~ Marky Mark.